LAS VEGAS, NV—(Marketwired – Dec 11, 2014) – Shift4 Corporation, provider of the world's largest independent payment gateway, today announces the successful conclusion of another year of its Birdies4Shriners fundraiser that pairs golf and giving to support the efforts of Shriners Hospitals for Children. Birdies4Shriners tracks the play of PGA TOUR professional Ryan Moore, who has been sponsored by Shift4 since 2011, and allows contributors to pledge donations for each shot he makes under par throughout the year. From individuals pledging 25 cents per shot to corporate executives whose total donations measured in the thousands of dollars, Shift4 thanks everyone who participated in Birdies4Shriners. In addition to the donations of generous individuals, Shift4 contributed $100 per birdie and $500 for each eagle that Ryan made in tournament play. This year, Ryan accumulated 301 birdies and eight eagles, generating $43,500 in donations and finishing the year 28th in the world golf rankings. “Ryan played some excellent golf this year and we're very pleased with the way he's represented Shift4 over the past three years that we've sponsored him,” said Shift4 CEO Dave Oder. During those three years, Shift4's Birdies4Shriners program has generated $208,500 — all of which has been donated directly to Shriners Hospitals for Children. 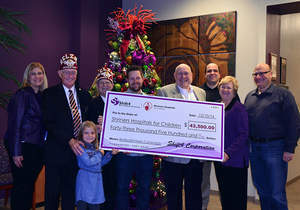 Ryan Moore joined Shriners Hospitals for Children representatives and Shift4's executive team at Shift4's corporate headquarters in Las Vegas for a check presentation. For more information on the Birdies4Shriners fundraiser, visit www.shift4.com/birdies4shriners. Shift4 Corporation makes it simple for merchants across all industries to securely process credit, debit, and gift card transactions. With connections to nearly every bank and processor in North America and integrations to hundreds of PMS/POS systems, Shift4's DOLLARS ON THE NET® is the world's largest independent payment gateway. Shift4 provides pre– and post–settlement auditing capabilities, fraud prevention tools, support for emerging technologies like EMV and mobile payments, and security solutions such as TrueTokenization® and P2PE, which drastically simplify PCI compliance — all for just pennies per transaction. Shift4 is a proud merchant advocate, maintaining complete bank and processor neutrality to ensure that their customers have the freedom to switch banks and processors as needed. For more information, visit www.shift4.com. Shriners Hospitals for Children® is changing lives every day through innovative pediatric specialty care, world–class research and outstanding medical education. The 22 hospitals in the United States, Canada and Mexico provide advanced care for children with orthopaedic conditions, burns, spinal cord injuries, and cleft lip and palate. Shriners Hospitals for Children is a 501(c)(3) nonprofit organization and relies on the generosity of donors. All donations are tax deductible to the fullest extent permitted by law. SUNNYVALE, CA—(Marketwired – Dec 11, 2014) – AMD (NYSE: AMD) today announced that President and CEO Dr. Lisa Su will present at the J.P. Morgan 13th Annual Tech Forum at International CES on Tuesday, January 6, 2015 at 2:25 p.m. PST in Las Vegas. A real–time audio webcast of the presentation can be accessed on the Investor Relations homepage: http://ir.amd.com. A replay of the webcast can be accessed approximately 4 hours after the conclusion of the live event and will be available for 30 days after the conference. Esterline Corporation (NYSE: ESL) (www.esterline.com), a leading specialty manufacturer serving global aerospace and defense markets, today reported fourth quarter earnings from continuing operations of $51.6 million, or $1.62 per diluted share, on sales of $548.1 million. Excluding charges associated with previously announced integration activities and incremental compliance costs, adjusted earnings from continuing operations in the quarter were $58.0 million, or $1.82 per diluted share. During the fourth fiscal quarter, the company continued to advance previously announced integration plans. These activities include the consolidation of facilities and improved cost efficiency through shared support services in sales and general and administrative functions. During the quarter, the company incurred integration and certain incremental compliance costs of $8.2 million, of which $3.4 million were reported as restructuring charges on the company's income statement; $2.2 million were reported in selling, general, and administrative (SG&A) expense; and $2.6 million were reflected in consolidated gross margin. For the full year, the company incurred costs related to its announced integration initiatives of $20.4 million and incremental compliance costs of $9.0 million and expects to spend approximately $20 million for these purposes in fiscal 2015. The company also continues to expect the integration activities to create savings in excess of $15 million annually starting in fiscal 2016. In the fourth fiscal quarter of 2014, sales increased 6.7% to $548.1 million, compared with $513.7 million in the prior–year period. This increase reflects solid gains in the Advanced Materials segment and the addition of the Sunbank acquisition completed in December 2013 in the Sensors & Systems segment. GAAP earnings from continuing operations in the fourth fiscal quarter of 2014 were $51.6 million, or $1.62 per diluted share. Excluding charges related to the company's integration and incremental compliance activities, adjusted earnings from continuing operations were $58.0 million, or $1.82 per diluted share, compared with $66.8 million, or $2.09 per diluted share, in the fourth fiscal quarter of 2013. For the full year of fiscal 2014, the company reported earnings from continuing operations of $166.0 million, or $5.12 per diluted share, on sales of $2.05 billion. This compares with fiscal 2013 results of $171.0 million, or $5.39 per diluted share, on sales of $1.89 billion. Adjusting for integration and compliance activities, full–year adjusted earnings from continuing operations in fiscal 2014 were $189.2 million, or $5.83 per diluted share. Comparable full–year earnings in fiscal 2013 were $184.4 million, or $5.81 per diluted share, adjusted to exclude a non–cash goodwill impairment and a discrete compliance charge. Full–year net earnings in fiscal 2014 were $102.4 million, or $3.16 per diluted share, compared with $164.7 million, or $5.19 per diluted share, in fiscal 2013. Gross margin in the fourth quarter of fiscal 2014 was 35.3%, compared with 38.9% in the prior year. The year–over–year decrease in gross margin was related to $2.7 million in restructuring charges, continued lower aftermarket product mix, and ongoing budget pressure in the combustibles and flares categories. For the full year, gross margin in fiscal 2014 was 35.1%, compared with 37.3% in fiscal 2013. SG&A expense as a percent of sales in the fourth fiscal quarter of 2014 was 17.2%, or $94.2 million, compared with $87.3 million, or 17.0% of sales, in the prior year. Adjusted for integration and compliance costs, SG&A margin improved to 16.8% of sales. Full–year SG&A expense in fiscal 2014 was $364.3 million, or 17.8% of sales, compared with $366.6 million, or 19.4% of sales, in fiscal 2013. The company's income tax rate in the fourth fiscal quarter of 2014 was 19.9% compared with 20.5% for the prior–year period. Cash flow from operations was $219.3 million during fiscal 2014, or 132% of income from continuing operations. Reusser said, “Our continued ability to generate strong cash flow gives us confidence in our capacity to fund future growth while delivering increased value to shareholders. Our share repurchase program is designed to work in concert with our integration activities to enhance our return on invested capital.” The company reported that during fiscal 2014, it repurchased 269,228 shares for $30.3 million. New orders for fiscal 2014 were $2.0 billion compared with $1.9 billion for fiscal 2013. Orders by segment for fiscal 2014 increased for the Sensors & Systems and Advanced Materials segments compared with the prior–year period. Orders for Avionics & Controls for fiscal 2014 were even with the prior–year period. Backlog at the end of fiscal 2014 was $1.1 billion compared with $1.2 billion at the end of fiscal 2013. In the fourth fiscal quarter of 2014, a plan was approved to sell certain non–core business units including Wallop Defence Systems in the Advanced Materials segment, Eclipse Electronic Systems and a small distribution business in the Avionics & Controls segment, and Pacific Aerospace and Electronics in the Sensors & Systems segment. These businesses are reported as discontinued operations. Based upon the estimated fair values, we recorded an estimated after–tax loss of $49.5 million in the fourth fiscal quarter of 2014 on the assets held for sale in discontinued operations. All previous–period financial information has been restated to reflect these businesses as discontinued operations. The company today also provided guidance for Fiscal 2015, an 11–month fiscal year ending on October 2, 2015. The change in year–end, as previously announced, is to better align reporting with the company's peer group, and to smooth the somewhat artificial seasonality of the prior fiscal year–end timing. Revenues for the 11 months are expected to be in the range of $1.85 billion to $1.95 billion. Adjusted earnings per share from continuing operations, excluding anticipated integration and compliance costs, are expected to be in the range of $5.35 to $5.75 per diluted share for the 11–month period. Esterline will host a conference call to discuss this announcement today at 5:00 p.m. Eastern Time (2:00 p.m. Pacific Time). The U.S. dial–in number is 877–546–5018; outside the U.S., use 857–244–7550. The pass code for the call is: 13859494. This press release includes non–GAAP financial measures — adjusted earnings from continuing operations and adjusted earnings from continuing operations per diluted share — that have not been calculated in accordance with generally accepted accounting principles in the U.S. (GAAP). Adjusted earnings from continuing operations consist of earnings from continuing operations attributable to Esterline plus the costs associated with certain integration activities — including restructuring charges — and incremental compliance costs incurred in each period presented. The prior full–year period was adjusted for a $10 million charge related to a DDTC matter and a $3.5 million goodwill impairment charge. Adjusted earnings from continuing operations per diluted share divide each element of adjusted earnings from continuing operations by the weighted average number of shares outstanding, diluted for each period presented. In accordance with the SEC's requirement, below is the reconciliation of the non–GAAP measures to the comparable GAAP financial measures. The company provides non–GAAP financial measures as supplemental information to our GAAP financial measures. Management uses adjusted earnings from continuing operations and adjusted earnings from continuing operations per diluted share to (a) evaluate the company's historical and prospective financial performance and its performance relative to its competitors, (b) allocate resources, and (c) measure the operational performance of the company's business units. In addition, management believes investors' and financial analysts' understanding of the company's performance is enhanced by including these non–GAAP financial measures as a reasonable basis for comparing the company's historical results of operations. These non–GAAP financial measures are not meant to be considered in isolation or as a substitute for the comparable GAAP measures. There are limitations to these non–GAAP financial measures, because they are not prepared in accordance with GAAP and may not be comparable to similarly titled measures of other companies due to potential differences in methods of calculation and items that comprise the calculation. The company compensates for these limitations by using these non–GAAP financial measures as a supplement to the GAAP measures and by providing reconciliations of the non–GAAP and comparable GAAP financial measures. The non–GAAP financial measures should be read only in conjunction with the company's consolidated financial statements prepared in accordance with GAAP. This press release contains “forward–looking statements” within the meaning of the Private Securities Litigation Reform Act of 1995. These statements relate to future events or our future financial performance. In some cases, you can identify forward–looking statements by terminology such as “anticipate,” “believe,” “continue,” “could,” “estimate,” “expect,” “intend,” “may,” “might,” “plan,” “potential,” “predict,” “should” or “will,” or the negative of such terms, or other comparable terminology. These forward–looking statements are only predictions based on the current intent and expectations of the management of Esterline, are not guarantees of future performance or actions, and involve risks and uncertainties that are difficult to predict and may cause Esterline's or its industry's actual results, performance or achievements to be materially different from any future results, performance or achievements expressed or implied by the forward–looking statements. Esterline's actual results and the timing and outcome of events may differ materially from those expressed in or implied by the forward–looking statements due to risks detailed in Esterline's public filings with the Securities and Exchange Commission including its most recent Annual Report on Form 10–K. 1 Includes a $3.5 million impairment charge against goodwill of Racal Acoustics, Ltd. (Racal Acoustics). SAN DIEGO, CA—(Marketwired – Dec 11, 2014) – PURE Bioscience, Inc. (OTCQB: PURE), creator of the patented silver dihydrogen citrate (SDC) antimicrobial, today reported financial results for the fiscal first quarter ended October 31, 2014 (Fiscal Q1 2015). October 2014 – SUBWAY® Restaurants* authorized PURE® Hard Surface disinfectant to be sold for use in all of its 27,000 U.S. stores. Executing to plan for phased national sales rollout. November 2014 – Initiated product production to support phased sales rollout in select markets. Initial, modest sales orders began in November. * SUBWAY® is a registered trademark of Doctor's Associates, Inc. This week announced White Paper results of Listeria remediation of a food processing facility with use of PURE® Hard Surface disinfectant to decontaminate shuttered plant. Plant and equipment cleared by FDA for future use in food manufacturing. Rollout plans in development with food processors/manufacturers for in–plant adoption. Broadening market reach through selective sales collaboration with food plant sanitation service companies. November 2014 – Withdrew, without prejudice, our Food Contact Notification (FCN) to the FDA for raw poultry processing (test results indicated the ability to reduce Salmonella below detectable levels). Communications on–going with FDA to assess additional data needed for FCN re–submission. October 2014 – Submitted Food Contact Notification (FCN) to the FDA for produce processing, which also will be subject to our on–going discussions with the FDA to assess the additional data that may be required to support this FCN. Test results indicated over a 100–fold improvement over current industry practices in reducing pathogens such as Listeria, E.coli and Salmonella. September 2014 – Commenced initial testing for use as a processing aid for beef and pork. Subject to updated guidance from the FDA, we expect to submit a Food Contact Notification (FCN) to the FDA for beef and pork processing in 2015. Obtaining necessary FDA and USDA approvals would create access to an estimated addressable $1+ billion U.S. market for this new application for poultry, produce and meats. To fund operations for at least the next twelve months enabling the Company to focus on commercialization and revenue generation. Help position PURE to pursue its stated objective of up–listing to a national exchange. Revenues for the first fiscal quarter of 2015 were $117,000, comparable with revenues of $115,000 for the first fiscal quarter of 2014. Total operating costs and expenses, excluding share–based compensation, other share–based expenses, and restructuring costs, for the first fiscal quarter of 2015 and 2014, were $1.4 million and $1.2 million, respectively. The fiscal first quarter 2015 net loss was ($1.9 million) compared with ($3.8 million) for fiscal first quarter 2014. Our pro forma net loss, adjusted for significant items, for fiscal first quarter 2014 and fiscal first quarter 2013 was ($1.3 million) and ($1.1 million), respectively. Cash and cash equivalents, reported as of October 31, 2014, was $5.3 million. Total adjusted liabilities, excluding restructuring liabilities, were $686,000, a net reduction of $833,000, or 55%, compared with Fiscal Year 2014 adjusted total liabilities of $1,519,000. Hard Surface and Food Contact Surface disinfectant – commercialize the current EPA registered PURE® Hard Surface disinfectant and sanitizer for use in food service operations and food manufacturing. Direct Food Contact – commercialize, subject to receiving both FDA and USDA approval, the use of SDC as a food processing and intervention aid for food processors for treating poultry, produce, beef and pork. Establish strategic alliances to maximize the commercial potential of our technology platform. Protect and enhance our intellectual property estate. Provide incremental cost savings and increase production scale. Seek up–listing to a national stock exchange. Hank R. Lambert, Chief Executive Officer, said that, “We were gratified that after extensive validation of our SDC technology, SUBWAY® authorized PURE Hard Surface for use in all of their U.S. stores. The phased national sales rollout is underway with encouraging initial results. “We have also begun capitalizing on this important validation of our product in our ongoing sales efforts to introduce additional restaurant chains to the superior efficacy of SDC. We continue to see a growing interest in testing our products from multiple branded chains. The Company will host an investor conference call on Thursday, December 11, 2014 at 1:30pm PST (4:30pm EST). The Participant Dial–In Number for the conference call is 1–631–982–4565. Participants should dial in to the call at least five minutes before 1:30pm PST (4:30pm EST) on December 11, 2014. The call can also be accessed “live” online at http://public.viavid.com/index.php?id=112054. A replay of the webcast will be available on the Company's website (http://www.purebio.com/about/investor_relations). Also, a replay of the conference call will be available by dialing 1–877–870–5176 (international participants dial 1–858–384–5517) starting December 11, 2014, at 7:30pm EST through December 25, 2014 at 11:59 pm EST. Please use PIN Number 90612. PURE Bioscience, Inc. is focused on developing and commercializing our proprietary antimicrobial products primarily in the food safety arena — providing solutions to the health and environmental challenges of pathogen and hygienic control. Our technology platform is based on patented stabilized ionic silver, and our initial products contain silver dihydrogen citrate, or SDC. SDC is a broad–spectrum, non–toxic antimicrobial agent, which offers 24–hour residual protection and formulates well with other compounds. As a platform technology, SDC is distinguished from existing products in the marketplace because of its superior efficacy, reduced toxicity and the inability of bacteria to form a resistance to it. PURE is headquartered in El Cajon, California (San Diego metropolitan area). Additional information on PURE is available at www.purebio.com. Any statements contained in this press release that do not describe historical facts may constitute forward–looking statements as that term is defined in the Private Securities Litigation Reform Act of 1995. Forward–looking statements inherently involve risks and uncertainties that could cause our actual results to differ materially from the forward–looking statements. Factors that could cause or contribute to such differences include, but are not limited to, the Company's cash position and liquidity requirements; the Company's failure to implement or otherwise achieve the benefits of its proposed business initiatives and plans; acceptance of the Company's current and future products and services in the marketplace, including acceptance of the Company's PURE Hard Surface disinfectant by SUBWAY® franchisees; the ability of the Company to develop effective new products and receive regulatory approvals of such products, including the required regulatory approvals to use its SDC–based technology as a direct food contact processing aid; competitive factors; dependence upon third–party vendors, including to manufacture its products; and other risks detailed in the Company's periodic report filings with the Securities and Exchange Commission, including our quarterly report on Form 10–Q filed on December 11, 2014. You should not place undue reliance on these forward–looking statements, which speak only as of the date of this press release. By making these forward–looking statements, the Company undertakes no obligation to update these statements for revisions or changes after the date of this release. SAN JOSE, CA—(Marketwired – Dec 11, 2014) – Cisco (NASDAQ: CSCO) today announced a comprehensive data and analytics strategy and solutions portfolio. The Cisco Connected Analytics for the Internet of Everything portfolio will help customers extract value from data generated by a rapidly expanding ecosystem of connected people, processes, data and things that together forms the Internet of Everything (IoE). The portfolio includes easy–to–deploy software packages that bring analytics to data regardless of its location. To date, analytics solutions have been designed to help organizations apply analytics and extract useful insights from data that was mostly created within the organization's four walls, and almost always resided in a centralized data store. Today, that model of analytics is severely challenged. Data generated by IoE is increasingly massive, messy, everywhere — and on the move. It's coming from every imaginable source and often from the edge of networks from mobile devices and sensors. Key decision makers are struggling with how to make sense of the data and use it to their advantage, while IT managers are struggling to provide the business with all the data they need in real time. A new Cisco study finds that 40 percent of survey respondents regard the inaccessibility and inability to interpret data as the biggest obstacle to translating connections into actionable insights. Cisco Consulting Services also estimates that analytics will drive $7.3T of the $19T IoE opportunity over the next 10 years. To capture this opportunity, a new approach is needed to get analytics to the data for instant insights. Cisco is combining intelligent networks and infrastructure with data virtualization to enable customers to access highly distributed data, while adding analytics capabilities to extract valuable insights. This powerful combination allows customers to correlate historic data at rest with real–time streaming analytics at the edge, enabling customers to immediately respond to threats, dramatically improve business operations, and provide their employees and customers with the best experience possible. Through its leadership in the Intercloud, the world's largest global network of clouds, Cisco enables organizations to bring together centralized and widely distributed data within the organization and incorporate data created and stored in public and private clouds. Connected Analytics for Events: Uses insights from Wi–Fi and device usage reporting to provide immediate visibility. For example, it can be used to evaluate sports fan behavior. Understanding what fans are doing, where they are in the venue and what kind of experience they are having allows organizations to make split–second decisions that will enhance the fan experience by indicating for example, where concession stands need additional staffing or where extra event security may be needed. Connected Analytics for Retail: Correlates in–store video camera feeds and Wi–Fi data with existing operational data such as inventory. Retailers can track in–store patterns and use existing video technology to determine, for example, where shoppers are spending more time in the store and which shelves need restocking, information that can immediately be used to improve shoppers' experience and drive better store performance. Connected Analytics for Service Providers: Provides intelligence based on patterns in networks, operations and customer data. End–to–end visibility helps service providers improve network planning and understand infrastructure investments in the context of service usage/adoption, and customer and competitive dynamics. These insights help service providers deliver a better and more personalized experience such as more accurate recommendations on the types of movies a customer may enjoy or the ability to send out alerts regarding usage in advance of billing cycles. Connected Analytics for IT: Provides business intelligence and insights to help align IT capabilities such as data management and data governance with business objectives. For example, analytics can be applied to align implementation of new IT capabilities such as deploying collaboration technology in new branch offices or by understanding evolving security requirements in real time so organization can mitigate risk by improving cyber security. Connected Analytics for Network Deployment: Analyzes the network for operational efficiencies, resolution of incidents and visibility into network deployment. It allows organizations to detect issues before they happen for proactive problem resolution and to make future strategic decisions on how to drive maximum network stability and performance at the lowest possible cost. Connected Analytics for Mobility: Uses location analytics to analyze wireless networks and provide insights about Cisco Service Provider Wi–Fi solution customers. By learning about Wi–Fi use patterns and adoption, service providers can proactively plan Wi–Fi capacity, improve business operations and uncover potential new revenue opportunities such as how to tailor pricing plans based on customer usage. Connected Analytics for Collaboration: Measures the adoption of collaboration technologies internally so a company can analyze Cisco Collaboration applications. For example, an organization can track how many employees are adopting the collaboration technology, how they are using it and what kind of ROI they are seeing from collaborative selling or how the technology is helping reduce travel costs. Connected Analytics for Contact Center: Provides visibility across an organization's entire call center services to deliver actionable recommendations that help organizations understand their customers, provide better service, and improve customer satisfaction. For example, with this visibility, organizations can make adjustments to ensure that the right calls are routed to the right level of service in a timely manner. These offers build on Cisco's innovative IOx platform, which allows customers and solution providers across all industries to develop, manage and run software applications directly on Cisco® industrial networked devices, including hardened routers, switches, and other devices. The Connected Analytics portfolio is globally available. Consistent with Cisco's ongoing commitment to partners, the portfolio will be enabled through a specific program to help them expand their practice. Follow @Cisco and the #CiscoGEC hashtag for live updates. PUNE, INDIA—(Marketwired – Dec 11, 2014) – How does celebrating the New Year's Eve at a world–class new Marriott hotel in Chakan Pune sound? Chakan is a unique and serene destination with its countryside charm just an hour away from Pune city and Navi Mumbai. 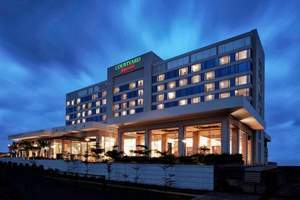 Courtyard by Marriott Pune Chakan is a beautiful oasis with its 175 rooms, an all–day restaurant, MoMo Café, and a bakery MoMo 2 Go. It promises to be a refreshing and fun option for an overnight stay to celebrate New Year's Eve with your friends and family. The Pune hotel is offering an enticing promotion, featuring a room package for the 31st December, 2014 inclusive of a night's stay in a well–appointed deluxe room, breakfast buffet, access to the New Year's Eve Party with a DJ at the poolside and ballroom, as well as unlimited domestic alcohol and an elaborate spread of food. Guests can party into the wee hours of the night as they can avail of a late check–out facility the next day till 6PM. There are also special New Year's Eve party packages on offer, excluding the stay option. There will be a special Kids' Corner too with a dedicated buffet, soft beverages, juices, and abundant entertainment options such as games, cartoon screenings and painting! With its plethora of recreation activities, everything you could possibly need is right in the hotel — pool volleyball, a pristine lawn, table tennis, carom and other group activities that you can bond over with your close ones as you welcome 2015! This will be a New Year's event in Pune you don't want to miss. Reservations can be made by contacting 021–3566 6651/66. Set in the heart of the city's auto and manufacturing hub, Courtyard Pune Chakan brings the first international business hotel to the area, offering excellent services, state–of–the–art technology and world–class amenities. Suites and guest rooms at this hotel feature subtle style, plenty of space and amenities such as a desk with ergonomic chair, high–speed Internet access, 37–inch LED TV, iPod dock, 24–hour room service, minifridge and coffee/tea service. Twelve residence suites are also available. As the area's only business hotel, the Courtyard Pune Chakan is the top choice for meetings and events and offers 11,725 square feet of indoor and outdoor function space. This contemporary hotel offers alternative meeting spaces at its dining venues, which include MoMo Café and Bar, featuring a menu of international and regional fare. The hotel sits conveniently near popular landmarks, including Pimpri Chinchwad, Pune University, and Talegaon. This Gold LEED certified hotel does its best to keep both the environment and its guests in top form. LEEDS, ENGLAND—(Marketwired – Dec 11, 2014) – Sharing in the global passion of rugby, a central Leeds hotel was the host venue for the recent Rugby Business Network Leeds which brought together rugby players, sporting legends and dedicated supporters from across the region to share their enthusiasm. 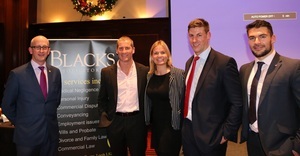 An exciting networking opportunity between the sporting world and regional business people, the 10 December 2014 event, held at the Leeds Marriott Hotel, featured England Rugby Union Head Coach Stuart Lancaster as the keynote speaker. Drawing a robust crowd to the Leeds city centre hotel's stylish event space, Lancaster is known for leading England to two second place finishes in the 2012 and 2013 RBS 6 Nations and for also defeating the world champion New Zealand team by a record score of 38–21 during the 2012 season. During the evening, he spoke of his experiences surrounding cultural and leadership strategies within professional sports and how the same strategies can be applied to business. As a global RBN sponsor, Marriott hosts similar events around the world in support of the not–for–profit organisation's effort to connect with senior business people who share a passion for rugby in the hopes they can justify a sustained commitment to the sport. While supporting the rugby community, the meetings also provide an opportunity for the hotel to showcase the many attributes of the Leeds accommodation in hosting business and social events. Boasting 702 square meters of flexible event space complemented by inspirational menus and customized catering as well as the services of professional event managers, the hotel is dedicated to ensuring every event is destined for success. Known for its legendary service and dynamic spaces, the Leeds Marriott Hotel is not only one of the area's top business hotels but those seeking accommodation in Leeds quickly discover a well–rounded offering of amenities that include everything from thoughtfully–designed guest rooms with luxurious bedding ensembles to tantalizing steakhouse dining at the Midtown Grill Restaurant so they can balance their work and life for a relaxed, yet productive stay. The Leeds Marriott Hotel welcomes guests with the elegance and intuitive service befitting a contemporary four–star hotel. Conveniently nestled in the historic Leeds city centre, the upscale lodging is located across from the popular Trinity shopping centre and just a short walk from the train station allowing guests easy access to the entire city. Featuring a variety of guest rooms and suites, all accommodations offer high–speed Internet access, international cable/satellite service with premium movie channels and room service; or travellers can upgrade for added amenities and Executive Lounge access. On–site restaurants, a Leisure Club featuring one of the largest hotel pools in the city centre and handy access to the adjacent Aveda Spa are just a few of the amenities that make the Leeds Marriott a brilliant travel destination. CHICAGO, IL—(Marketwired – Dec 11, 2014) – To celebrate and recognize the Jewish holiday of Hanukkah which begins on December 16, audiobook and video publisher Dreamscape Media announced today that it is making The Miracle of Hanukkah, a musical re–telling of the holiday story for younger listeners, available as a free download on its website. 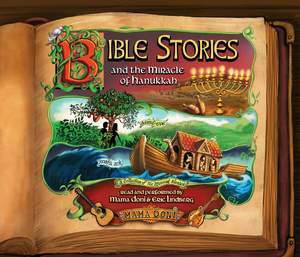 The story is but one chapter from the new, exciting and original Dreamscape children's audiobook, Bible Stories and The Miracle of Hanukkah, by Doni Zasloff (Mama Doni), performed by Doni Zasloff, with an original musical score written and performed by Eric Lindberg. The entire audiobook is available on iTunes, hoopla, Overdrive, Dreamscape and at local libraries. Bible Stories and The Miracle of Hanukkah listeners will experience new, contemporary and enchanting readings of some of the Bible's most beloved stories by three–time Parents' Choice® Award–winner Doni Zasloff (who performs as Mama Doni). Beautiful storytelling is accompanied by a rich, original musical soundtrack that helps guide young listeners through Biblical history, from the creation story to life on Noah's Ark. Mama Doni and acclaimed instrumentalist Eric Lindberg have created a symphony of story and sound the illuminates these eternal tales in a modern fashion that will delight listeners of all ages. Stories include: In The Beginning, Adam And Eve, Noah's Ark, Joseph And The Coat Of Many Colors, Queen Esther, and featuring The Miracle Of Hanukkah (Story from the Books of the Maccabees). The audiobook also features two original bonus songs (music and lyrics by Doni Zasloff & Eric Lindberg): Hanukkah Oh Hanukkah, Eight & Hine Mah Tov. Doni Zasloff (Mama Doni) is an award–winning performer, songwriter, and author. She has released CDs and DVDs, including Chanukah Fever, Shabbat Shaboom, Emunah, Mama Doni's Jewish Holiday Party and The Acoustic Jewish Holiday Collection. She also co–authored the book Get Cooking! Doni is a beloved presence on stage and tours regularly nationwide. Eric Lindberg is an award–winning multi–instrumentalist who brings his background in Jazz and classical music to the acoustic sounds of bluegrass and old–time music. 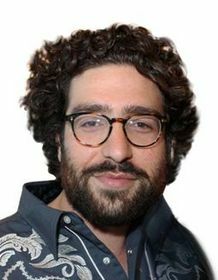 He works alongside Doni Zasloff as musical director and partner on their recordings and performs throughout the country with her in the acoustic bluegrass duo, Nefesh Mountain. Dreamscape Media, a division of Midwest Tape, is a media development group focusing on production, distribution, publishing and licensing, with an emphasis on the library/educational market. It produces audiobooks, book–based children's video programs and offers video and audio distribution services. Dreamscape titles can be found in library and retail channels. hoopla digital® is the innovative new digital library service from Midwest Tape that partners with public libraries to provide online and mobile access to thousands of movies, TV shows, music, and audiobooks, and launching in 2015, eBooks. With hoopla digital, patrons can discover great new titles all from a single mobile app or browser, and instantly stream or download with a valid library card. Founded in 1989, Midwest Tape, LLC., a privately held library media distribution company based in Holland, Ohio, provides public libraries across the US & Canada with shelf–ready audio and video products as well as a wide variety of business solutions, enabling them to better serve their patrons.